Whenever a new exotic car comes out, enthusiasts always ask the same question: can you daily drive it? Regarding the Alfa Romeo 4C, I’ll answer this question with another question: you could daily drive a riding lawnmower. But do you really want to? In order to find out if you can daily drive an Alfa 4C, I spent the day with one, courtesy of Cyrus at exotic rental car firm Broadway SuperCars. And while I don’t want to reveal all of my thoughts just yet, I will say this: at the end of the day, when I returned the 4C and drove home, the Aston felt like one of those giant Lexuses that incredibly old people lose in parking lots after a symphony performance. I made a video that thoroughly covers the 4C’s capabilities as a daily driver. However, I am also writing this column for those of you who are currently in a place where you can easily spend a few minutes reading, but not a few minutes watching a video, such as a Tinder date. So I will start with comfort. Plainly speaking, the 4C has none. The 4C is uncomfortable to get inside, uncomfortable to sit in, uncomfortable to ride in, uncomfortable to steer, and generally lacking any sort of comfort assistance or aids, such as adjustable seatbacks, or reasonably sized sun visors, or, you know, seat padding. Then there’s practicality: the 4C has precisely three in-cabin storage spaces. Two are found between either door and either seat; small black leather-wrapped slots that are large enough to hold major items such as a notecard, but too small to hold gluttonous extravagances such as a tissue box. For that, you’d have to consult The Box, a small storage box between the seats where you could fit a midsize tube of toothpaste, or a full-size tube of toothpaste, or a small child, assuming he is no larger than a full-size tube of toothpaste. Of course, the 4C also includes a trunk. More on that in a moment. For now, I’ll say that the 4C offers a mere 3.7 cubic feet of cargo space. By comparison, the Porsche Cayman offers 15 cubic feet. That boat. And then there’s visibility. In front, the blind spot is nonexistent. To the side, the blind spot is minimal. In back, the blind spot could hide a regional airport. Fortunately, Alfa Romeo has developed a solution for this: in the 4C I drove, the roof comes off, so you can stick your head out the top and accurately assess the situation in back. I am not sure what you’d do if you have a 4C Coupe, but I suspect the pesky roof could come off with a little elbow grease, a can-do spirit, and a giant electric saw. My favorite “quirk” is the trunk: there is no exterior release. It’s hard to explain how annoying this is until you actually daily-drive the vehicle and you realize that you’re stuck with a combination of a) no storage space on the inside, and b) no way to open the trunk from the outside. So you have no alternative when you want to bring something with you: you walk up to the car, you unlock the doors, you reach down and unlatch the trunk, you walk around to the back of the car, you open the trunk, and you stick your something inside. If you forget something, you must repeat the process again. 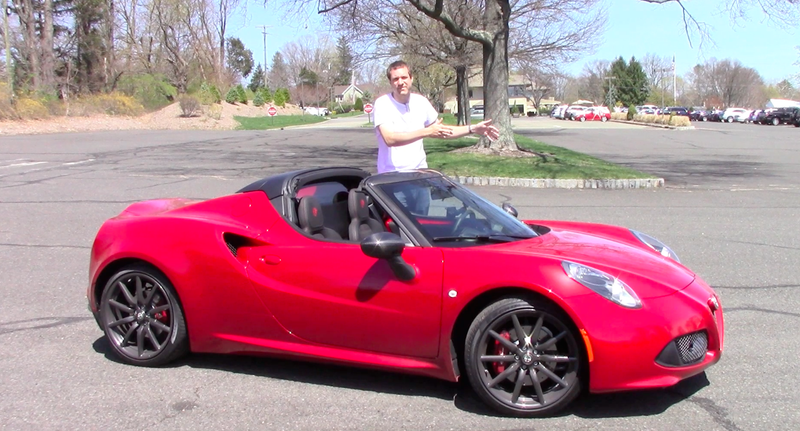 So is there anything good about the Alfa Romeo 4C? Uh, yes. Get it out on the open road and it’s a truly thrilling car; one of the most exciting, sporty, tossable vehicles I’ve driven in years. It goes wherever you tell it, it feels leagues more stable than my old Lotus, and it sounds like an exotic supercar despite the fact that it is, on paper, a three-fourths copy. And while it doesn’t have three pedals like I wish it did, the transmission is actually pretty good considering that we’re talking about a low-volume Italian sports car whose music USB port is a wire dangling down from the passenger side of the dashboard. So what’s my verdict? I would love to have a 4C. I would drive it on Sunday mornings, down curvy roads out in the country, feeling the rush of its acceleration, musing at the excellent cornering, and listening to the beautiful sound. And then, when I was done, I would return home and park it in my garage until the following Sunday.